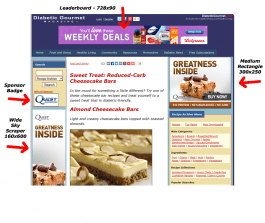 Diabetic Gourmet Magazine offers 3 of the most popular IAB standard banner sizes in above-the-fold positions. You won’t find clutter and excessive ad noise to distract readers from your brand (and we do not accept annoying pop-up type ads). Not only do your ads get seen, but they engage a targeted audience of people living with diabetes. Over the past 2 decades, we have worked with most major agencies, ad formats, and ad delivery services/systems. So, don’t worry about whether or not we can accomodate your banner advertising or ad tags. Keep reading for information about banner advertising, screen shots and rates. A Medium Rectangle is an advertising space that measures 300-pixels-wide by 250-pixels-high (300×250). Medium Rectangles are big and noticable and appear on the right side of our pages. A Wide-Skyscraper Ad is a very tall, rectangular advertising space that measures 160-pixels-wide by 600-pixels-high (160×600). Skyscrapers are very hard to miss. They can be seen along the side of website pages, alongside content. A Leaderboard Ad is a wide rectangular advertising space that measures 728-pixels-wide by 90-pixels-high (728×90) that can be seen at the top of website pages. It is the first ad seen on a page. Delivery limitiations can include time of day, day of week, specific date, country and browser.